Loock Galerie is pleased to host Miwa Yanagi‘s solo exhibition showing her new photographic series The goddess and the god separate under the peach tree (2016/2017). 2009, almost ten years ago, Miwa Yanagi represented Japan at the 53. Venice Biennale with Windswept Woman (2009) and has since developed various theatre productions. Her play Zero Hour: Tokyo Rose’s Last Tape (2015), for which she wrote the text, conceptualized the staging, as well as designed the costumes, was shown in Japan in 2015 and then travelled to different venues in Canada and the USA among them Los Angeles and Washington. In The goddess and the god separate under the peach tree, Yanagi associates Japanese mythology with Fukushima, Japan’s last major tragedy. 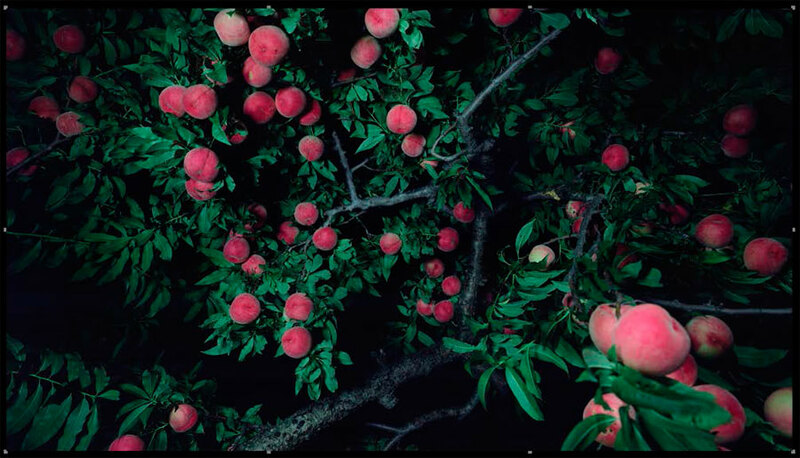 The peach-trees photographed by Yanagi are located in the district of Fukushima and their fruits can’t be sold outside of this area. They are the witnesses, as well as victims of this event.